XCOM: Board Game Unknown | SPACE-BIFF! 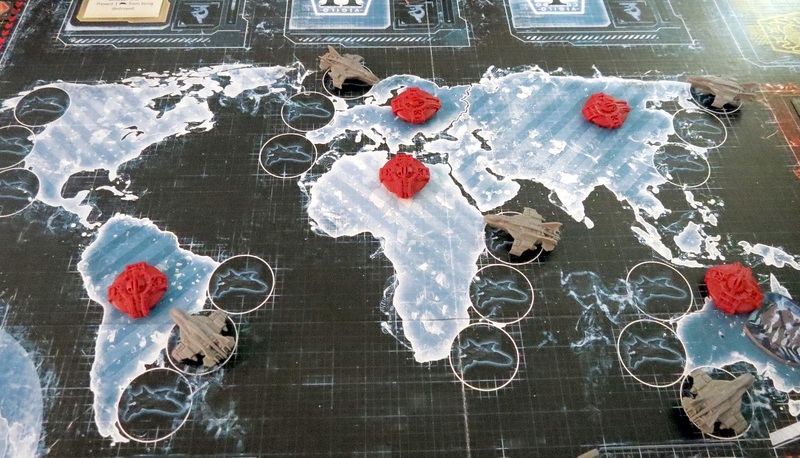 There’s a gentle irony to one of PC gaming’s most beloved turn-based games being turned into a real-time board game, but don’t let that fool you into thinking that XCOM: The Board Game doesn’t understand what gave XCOM its hallowed reputation. It’s almost a shame that the Best Real-Time Board Game Ever Award was granted in perpetuity back in 2008, because this right here represents something monumental in board game design. The fun half of the Commander’s job involves shooting down UFOs. I’m speaking, of course, about XCOM’s integration with the binary-transmitting pins-and-wires of computing technology. The game itself is slight, comparatively speaking, a board and some minis and not nearly as many cards as you might expect from a cooperative game. But instead of making its players handle the heavy lifting of randomizing a bunch of events in real-time, all that stuff is managed by an app, whether on your phone or tablet, which will batter you with the scenario and difficulty of your choosing. Even before this cardboard version of XCOM was released, a few naysayers had made their displeasure known — or should I say Enemy Unknown… no, I guess that doesn’t work. Anyway, these folks were unhappy not only because they would be forced at gunpoint to play this unnatural hybrid of cardboard and machine until their ears bled from the app’s mood-setting soundtrack, but also because there was simply no reason to sully the purity of our board games with digital components in the first place. Of course I’m being reductive, and I’ve wondered about many of those same questions. What, for instance, happens when Fantasy Flight Games stops supporting the app? Or when an Apple upgrade breaks everything and they can’t update fast enough? There are a handful of legitimate concerns that accompany such a bold move into board and app interdependency, and to be fair, the final product does in many ways leave something to be desired. The biggest issue is that the actual board game doesn’t come with a manual. Neither does the app; its best resource is an index, and reading its clunky oversized “sci-fi” font is sort of like being forced to study a dozen slow-scrolling pages of old MS-DOS text. On the other hand, the in-app tutorial is fantastic. Don’t know how to play? Follow the setup guide (which actually comes in the box, thank goodness) and then launch the tutorial. It’ll hold your hand through a couple simplified rounds and explain pretty much everything. Sadly, you’re then immediately dropped back into a dismal dystopian reality with no manual, so let’s hope you paid close attention when you had the chance. Even so, the app integration is pretty well done, and it feels appropriate that a game about advancing technology should also represent a modest leap in technological integration. Basically, the app furiously shouts at you for a few minutes, while the game’s four players struggle to react to its irrational commands. Or rather, the app shouts at the Central Officer, who then relays panicked requests to the rest of the team. COMMANDER, SELECT A CRISIS CARD. CENTRAL OFFICER, MORE UFOS HAVE APPEARED IN ASIA AND SOUTH AMERICA. SQUAD LEADER, ASSUME THE POSITION. COMMANDER, SELECT A CRISIS CARD. THEN ALSO ASSUME THE POSITION. The Central Officer also fights UFOs, but in space. There are four stations, each of which is integral to the success of your XCOM team. And while the game is playable with fewer than four people, it’s best done with the full complement, everyone talking over each other and then growing deathly silent as soon as the app beeps, and struggling to keep way too much information straight. The heart of the team is the Commander, if only because he writes the checks. See, every round gives you a budget, and the Commander can also draw upon emergency funding, though doing so too early or too often can mean you won’t have any cash later on. Whenever anyone deploys something, a satellite or soldier or interceptor or scientist, that’ll be a million credits please. If you blow past your spending limit, nations begin to panic and withdraw their support. And the Commander has to do this, paying exacting attention to everyone’s expenses, while also managing your supply of UFO-killing interceptors and choosing which crisis cards will hinder you that round. Meanwhile, the Central Officer is watching the app, relaying its commands to the rest of the team, while shooting down UFOs in orbit and trying to use their station’s cards to keep everyone else afloat, though good luck with that when you’re out of breath from relaying orders. The Squad Leader gets to deploy soldiers to defend the base and complete missions, a huge drain on resources that is nevertheless crucial — you can’t have an XCOM if the XCOM base is rubble, after all. And the Chief Scientist gets to assign researchers to different technologies. This last one is honestly a pretty easy job, so assign it to a child or the sickly for best results. Each of these tasks is incredibly simple, and they don’t often offer much of a challenge on their own. Sending out interceptors, for example, is as easy as matching them to where there are lots of UFOs over high-risk continents. Deploying soldiers is a symbol-matching minigame. Conducting research is about sitting quietly and not bugging the other players, then giving them cool toys. But the thing that makes it all come together is that you’ll be doing these simple tasks under pressure, while paying constant attention to the other stations’ needs. It breeds a sense of constant, overwhelming panic. You’ll have aliens kicking down your door, UFOs over every continent, different UFOs in orbit scrambling your communications, and two research projects that really should get done — and then you check with the Commander and it turns out you’ve only got eight credits on hand. The Squad Leader is tasked with defending the base and completing missions. Everything is looking great. Which is to say, things look terrible for your team, and that’s great fun. Then the resolution phase trundles around and XCOM starts to feel a bit flaccid. Basically, every threat is resolved the same way, from research to squad battles to dogfights. You get to roll a number of dice, and the more assets you put on the board, the more you get to roll. Each die provides a slim chance at getting closer to completing that new technology, shooting an alien, or blasting a UFO out of the sky. Simultaneously, you also roll an increasingly-dangerous alien die. This isn’t too worrisome at first, but each new round of rolls increases the likelihood that your squad will be killed or your interceptors blown up, or even that your poor scientists will have their latest invention blow up in their face. To its credit, this is some very tense dice-rolling. Every single toss will have your teammates holding their breath, tension mounting, the difference between absolute success and utter disaster never much further away than a seam in the table’s wood grain or a fuzzball in the felt. Still, it often feels like a whole lot of hullabaloo for what amounts to a push-your-luck dice game. You balance a budget, work closely with your teammates, make the best choices possible while the app beeps at you to hurry up… and then you roll some dice, probably fail your first roll, and then decide whether the next roll offers good enough odds to try again. Then repeat the same process the same thing for every single thing on the board. Foremost among the Chief Scientist’s duties is sipping daiquiris. Secondary: science. It’s simple. It works. And it certainly doesn’t destroy the game or anything like that, at least not unless you’re one of those folks who simply can’t stomach chance in your games. But after so much buildup, all that tension and so many careful decisions, it feels like a simplistic solution where something more elegant could have made XCOM the best real-time game of all time. As it stands, Space Alert is still the winner. All in all, XCOM is a fantastic game, largely propelled forward by its digital half. It nails the sense of terror that marked the PC games, especially when you realize that you don’t know what to do, the clock is ticking, and every person at the table is staring at you. And you’ll probably fail, because the aliens are numerous and scary and your Chief Scientist has apparently fallen asleep. Aside from a couple problems and a sense that the designers prized simplicity over compelling design during the resolution phase, this is a great game — and, crucially, a very good sign for hybrid digital/cardboard designs. I hope others will be bold enough to stand on its shoulders. Posted on February 20, 2015, in Board Game and tagged Board Games, Fantasy Flight Games, XCOM. Bookmark the permalink. 8 Comments. That’s it, I’m getting it. What is the “Best Real-Time Board Game Ever Award [that] was granted in perpetuity back in 2008”? Pingback: Прохождение | XCOM - Enemy Within | Литейный цех - S27. Pingback: Five Minutes to Impact | SPACE-BIFF!